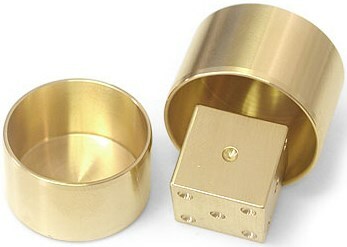 Effect: While your back is turned, a spectator examines a solid brass die, a round canister and its lid. He places the die inside the canister, any way he chooses, and remembers the number on top. He places the lid on the canister, sealing the die inside. You turn around, pick up the canister, concentrate for a moment, then announce the number that he is thinking of. You or the spectator can now open the canister, and the predicted number is revealed!